Originally built in 1867 as a monastery for the Christian Brothers by renowned Architects Ashlin and Pugin who are noted for designing many parliamentary buildings across Ireland and the Uk. The Late Victorian building was renovated by the McGowan family in 2005 who have transformed the magnificent building into a 16 bedroom boutique Hotel. 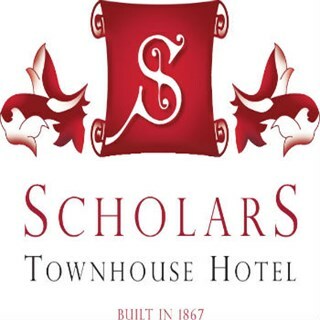 Scholars Townhouse is currently the only family owned hotel in the region and is renowned for its excellence in hospitality and customer service. The McGowan family Martin, Patricia and their two sons Mark and Glenn operate the Hotel to a very professional standard yet have created a homely atmosphere throughout the hotel and promise you the warmest of Irish Welcomes. The Hotel has 16 en suite bedrooms, a Fine Dining Restaurant, Bar and Gastrolounge. Scholars Townhouse is an excellent destination for food and relaxation. The hotel is very centrally located in the heart of Drogheda’s City Centre, all amenities and a host of attractions are a stones throw away. We had a group for breakfast, food and service was excellent. Had a lovely experience and will definitely be back. Staff were all very pleasant and kind. Not a bad word to be said about the whole experience. Very enjoyable evening good food, friendly staff and a very cosy surrounding. Everything about our dining experience was superb. Great night out with a delicious meal and great service in Scholars last night. We’ll be back! We had a staff lunch in the restaurant - food was delicious, service was excellent & staff very friendly. A wonderful venue for any occasion & always guaranteed a great atmosphere! Scholars Townhouse was extremely helpful when it came to booking our Christmas Party. Aisling in particular was very professional, friendly and no request was too big. We all had a super night and food was amazing. We'll look forward to coming back next year. Staff were very helpful and welcoming. They provided discreet assistance to a member of the part who is wheelchair bound. I made the booking last week on line for 6 people, this worked very well and I  got a call to confirm the day before. The booking was for 1pm. 3 of us were there before 1 and the remainder around 1.05. I suppose I should have emphasised in advance that we were on our lunch hour, but I assumed the service would be quicker. I am not sure what time our final order was taken and went in to the kitchen however I looked at my watch at 1.40 and we still had not been served. We were due back at work at 2pm. Having asked about the food, it arrived 5 mins later. We had all finished eating by 2.05, no time for deserts or tea. Next time I will ring order in. The food was delicious. Fantastic service, afternoon tea was delicious. Definitely will be making a return visit!!! all the team are very helpful and polite, our party enjoyed the evening immensely thank you. We had afternoon tea for a special occasion and we were looked after wonderfully. The room was fabulous and we will be back. The food is absolutely amazing! It’s like art on a plate! The combination of food and flavours are to die for! We’ll definitely be back if we’re in the area! Outstanding as before. Scholars has great character and you treat your guests very well. We loved our meal. Wish we had stayed in Scholars.